When I graduated from high school I had this poster under my ceremonial costume. It said something like “Thanks Mom! On to Auburn.” I’d been working at that for a while. The grades were no problem, but the money was tight. Two days after graduation I got my scholarship offer and off I went. And so I attended school there for five years. And then I left, because there was no work there in town. I would have stayed. But I went into the world instead and started making my way through it. In graduate school I met my future wife and on a date the next fall I took her to Auburn and she liked it. And then when she finished graduate school she got a job offer at Auburn. There was no suitable half way spot, and Auburn is a nice place to live and so we moved there. And we stayed for six years. Until today, when we finished loading up the car and brushing away tears and drove off into the midday sun. In between good things happened and great things happened and sad things happened. Life happened. One of the many smaller things that I did was to start riding bikes. And from there I started seeking out all of these historic markers all over the county. Today the Lee County project is officially completed. This is the last such site and, before we signed the papers selling our house today, this was the last thing I did. 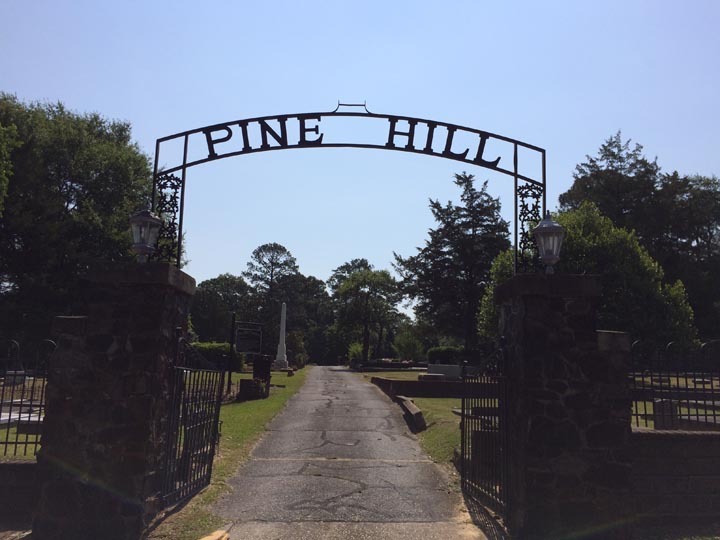 I visited Pine Hill Cemetery. And this is fitting. A small part of what I am now is because of Auburn. And a small part of what I am now is because of my appreciation for history. My mother asked me once why I liked history so much. I thought of two answers. I finally got lucky and had a history teacher who taught the material as more than names and dates. That stuck with me. But, when I was in undergrad at Auburn I found Pine Hill. It was an old cemetery that the city had almost forgotten about — which is a total Auburn thing to do, ignoring its own history — but they’d undertaken a big project about the time that I showed up to revitalize the place. As well they should. I love this place. I’m not the sort of person that hangs out in cemeteries, but this place is special. There are about 100 Civil War soldiers there. The man my high school was named after is buried there. The names on the buildings and roads in Auburn are almost all buried right here, in Pine Hill. And somehow, one day, that stuck with me too. It wasn’t names and dates, but people’s lives. History isn’t an abstraction if you walk through the doors of a place named in honor of the person resting right here. So, as I said, fitting that I would be here last. I saved it for just that reason. You can see my pictures from Pine Hill Cemetery right here. If you want to see all of Lee County, Alabama’s historical markers click here. This entry was posted on Friday, May 27th, 2016 at 9:08 pm	and is filed under Auburn, history, markers. You can follow any comments to this entry through the RSS 2.0 feed. Both comments and pings are currently closed.